Not pictured, the Scholarship Selection Committee: Eric Nitta, Val Kato, Ryan Okunaga and Ruby Uehara. 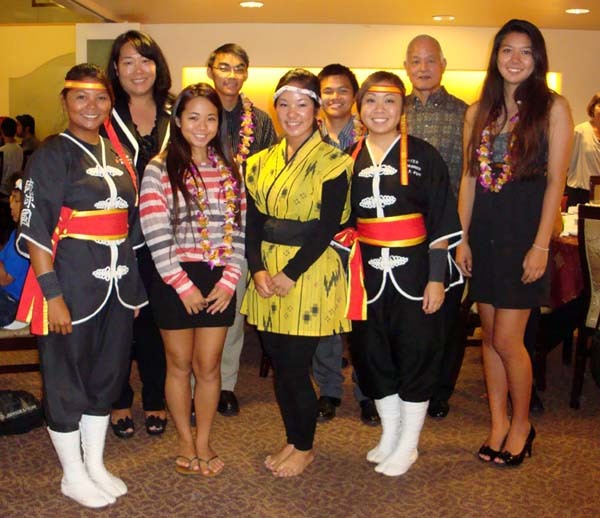 Congratulations to the following 2012 Hui Makaala Scholarship recipients. These students are well deserving of the scholarships as they have displayed excellence in academics, leadership characteristics at their respective schools as well as their communities and above all, have displayed a strong interest in perpetuating the Okinawan culture through various extra-curricular activities. At the Scholarship Banquet, emceed by President Lisa Shishido, club members were treated to recipient performances after a Chinese family-style lunch/ Later, the recipients and their families were touched by a a heartfelt "open letter" from a parent to a college-bound student, full of wisdom and best wishes, by guest speaker Pamela Tamashiro, past Hui Makaala and HUOA President.